Home/Car Stories/Flex Fuel? This is Flex Fuel! Chrysler Turbine Car Inside and Out; a Quick Look. Flex Fuel? This is Flex Fuel! Chrysler Turbine Car Inside and Out; a Quick Look. You think Flex Fuel is something new? How about this Chrysler Turbine Car from the mid 60s that will run on anything from diesel to perfume! If it is flammable the Chrysler Turbine Car can make it go. I fell in love with this car when I was in high school and it was just hitting the road. It was the Chrysler Turbine Car! It was like a Detroit Dream Car for the road and Chrysler gave them out to regular folks to drive for a few months! WOW! Living in rural Iowa I never thought I would ever see the car in person. There were lots of photos and even some model cars but I wanted to see the real thing. I never did. I never did that is until just recently. Katrina and I were driving back from a lap around the track at the Monster Mopar Weekend in St. Louis and my eyes about popped out of my head; there it was. Katrina had told me that there was some wild looking car driving around while I was cleaning up our car for the judges but unfortunately I shrugged it off as her spotting some old Valiant. When she said there it is again. I was driving; I slammed on the brakes, grabbed the camera and asked her to park the car! I had only minutes because it was on its way back to the Museum of Transportation but I made the most of it. I was not disappointed in the least. I still have my reservations about the rear end styling. It is over the top. If the rear fenders and taillights were more like a 61 thru 63 Thunderbird the car would be perfect. 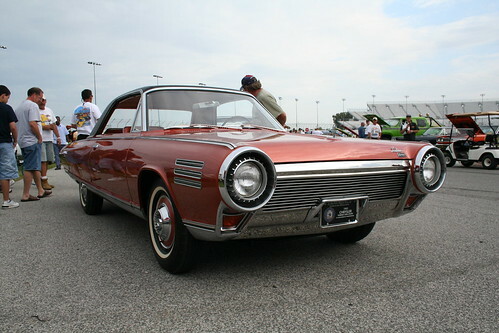 To see more on the Chrysler Turbine Car go to our Feature Car page and check it out.